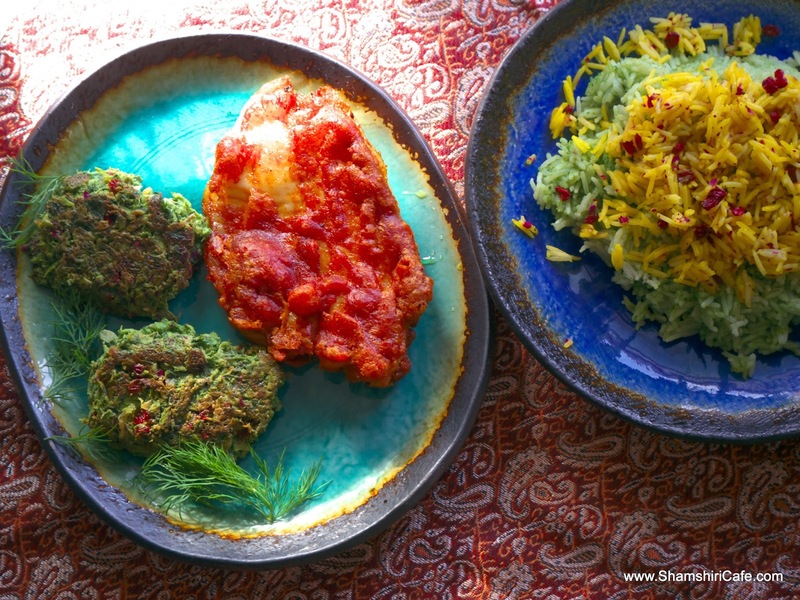 Herbs are of paramount importance in Persian cuisine. Innumerable varieties of local herbs grow in different corners of Iran. Such local, or, geographically more widespread herbs are extensively used in regional cuisines of Iran, as well as in the national cuisine of Iran. Two of the most favorite herb-packed Persian dishes are Ghorme-sabzi (i.e. 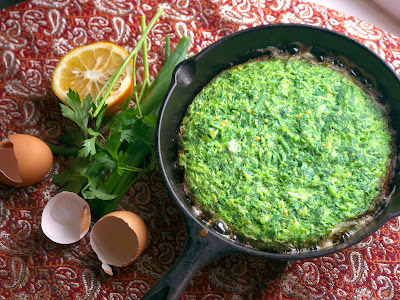 Herbal stew) and Kuku sabzi, a frittata made with an assortment of herbs and beaten eggs. Although the commonly accepted Kuku-sabzi recipe calls for the use of common herbs such as parsley and dill, many local versions of the dish might contain local herbs; as long as the following golden rule of thumb is respected: "Do not use aromatic herbs (e.g tarragon, savory,..), as they turn bitter." 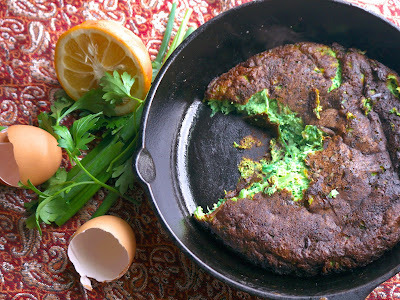 Kuku-sabzi is an excellent vegetarian food item which can contribute in preparation of sandwiches (falafel style), or it can be eaten with rice. * What depicted in the pictures, is based on a quarter of the recipe. Blend a small handful of the herbs with the eggs and salt. Blending, although not traditionally done, results in vivid green color of Kuku. Finely chop the rest of the herbs and mix with the egg mixture. In a skillet (or a non-stick pan) pour a thin layer of oil and set on medium heat. When the oil is hot, dump in the herbal custard; evenly spread it out, by shaking the pan. Let the edges of custard set. In case of the optional use of barberry and walnuts, spread them evenly on the surface and then press them towards the center of custard. Barberries burns and will taste bitter, in the case of direct contact with the hot pan. There are two options to finish the cooking. In case the pan is large and Kuku is spread thinly, invert it onto a plate and let it slither back to the pan and cook the other side. In case of thick Kuku, finish the cooking in a 400 F (205 C) oven. Depending on the thickness of the custard layer, 10 to 15 minutes should be devoted for a fully set Kuku. Kuku sabzi is part of the traditional Persian New Year's Eve dinner. The dinner consists of fried fish, herbal pilaf, and Kuku sabzi. The Persian New Year begins at the Spring Equinox, the very first moment of spring. Kuku-sabzi synthesizes the green spring. The very first picture of the post depicts such a dinner.